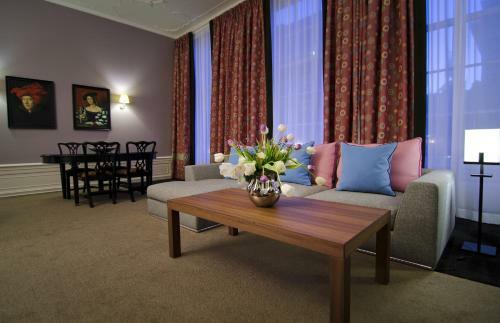 With on-site dining massage services and a fitness room the NH Grand Hotel Krasnapolsky offers comfort in a historic building on Amsterdam's Dam Square. Set in a historic six-story building that dates back to 1865 the hotel offers 468 rooms with parquet floors sitting areas coffeemakers cable TVs minibars safes robes slippers and a selection of various pillows. Stay in shape in the fitness room which includes a sauna or relax with a massage. The on-site restaurants serve breakfast lunch dinner and high tea. Indoor parking is available for a fee. Currency exchange and bike rentals are provided on-site. The property is located on Dam Square adjacent to the Royal Palace. Centraal Station is a five-minute walk from the hotel and there is a train station one block away. The Concertgebouw three miles from the property provides world-class entertainment. Visit the masterpieces at the Rijksmuseum and the Van Gogh Museum less than two miles away. It's a five-minute walk to the Floating Flower Market. Madame Tussauds is two blocks away. The upscale shops in the P.C. Hoofdstraat district are 15 minutes from the hotel. Schiphol Airport is 10 miles away.